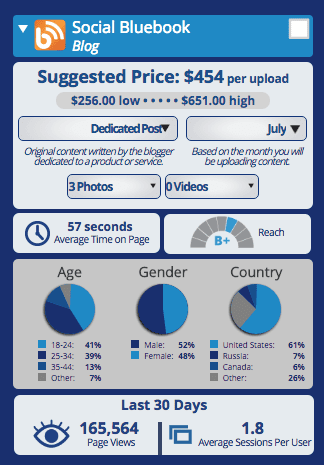 You can now find out your blog’s worth for branded content! 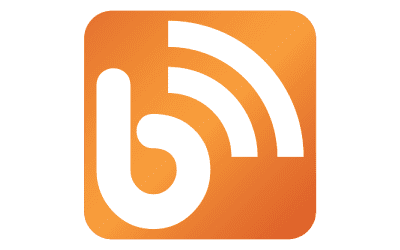 We are excited to announce that Social Bluebook has released the beta of valuations for blogs connected to Google Analytics. This has been a long-requested platform that we are excited to share with the blogging community. Once you get to the ‘Add Platform’ page, press the blog icon and sign in to your Google Analytics account. From there you will be directed back to Social Bluebook. Don’t have your blog connected to Google Analytics? Connecting your blog to Google Analytics is easy and offered through most major blogging platforms. WordPress.com offers Google Analytics for Business Plan websites. WordPress.org offers several plugins to easily activate Google Analytics. Blogger/Blogspot is owned by Google and offers several methods of connecting to Google Analytics which are outlined in this WikiHow article. Tumblr offers their own documentation on how to connect your blog to Google Analytics. SquareSpace also offers documentation on how to connect your blog to Google Analytics. Ghost offers a blog post on how to add Google’s tracking code to your blog. Weebly provides documentation on adding the tracking code to the header of your site. Wix allows Premium Plan members with their own domain to connect to Google Analytics. Joomla! offers several plugins for Google Analytics. Drupal has an actively maintained Google Analytics module that you can download. Typepad offers an add-on for Google Analytics. Postach.io has a quick walkthrough on adding Google Analytics to your blog. Google Analytics, unfortunately, is not currently available on the Medium blogging platform. Social Bluebook offers a suggested value for three job types: a dedicated blog post, a guest post, and a giveaway. A dedicated blog post is your usual sponsored post: it is completely original content created by the owner of the blog for a sponsored product or service. Just like for all other social media platforms, the product being promoted should cohere with the regular content of the blog. A guest post focuses on content written by someone else but is published on your blog for the purpose of promoting their product or service to your audience. Make sure that the guest post complies to FTC guidelines and that the person contacting you is not guilty of spammy guest posts used for the sole purpose of illicitly improving SEO. Finally, following Google’s general guidelines will help ensure your website is not penalized in its PageRank. Giveaways typically involve a brand partnering with a blogger to offer free product via a contest. These contests usually link to the site where the brand is hosting the official giveaway. Social Bluebook also pulls several metrics about your blog straight from Google Analytics. The platform infographic integrates both audience demographics and specific metrics for your blog. These demographics pull information for the last twelve months about your audience’s age, gender, and global location. Social Bluebook provides the percentage breakdown of your top three audiences by age and location. Alongside the demographics are the metrics calculated from the information received via Google Analytics. Currently included in these metrics are a reach grade that compares your reach to other bloggers, how many page views you have received within the last thirty days, the average time a visitor spends per page on the site, and the average number of sessions per user. The release of blog valuations is but one of many new features Social Bluebook plans to roll out this year. Keep an eye on your inboxes – there is more to come soon. It looks like your blog is not connected to Google Analytics. Click here to learn more about Google Analytics. Sorry to hear you’re having troubles connecting your blogs. Please reach out to us at support@socialbluebook.com and we will be able to assist you further from there. This is a great post! I’m so glad to see that social blue book offers such excellent services. I love the analytics – they really helped me see how well my shorting a stock was doing!